Everyone's favorite Robot is finally available as a motorized tin toy wind-up. 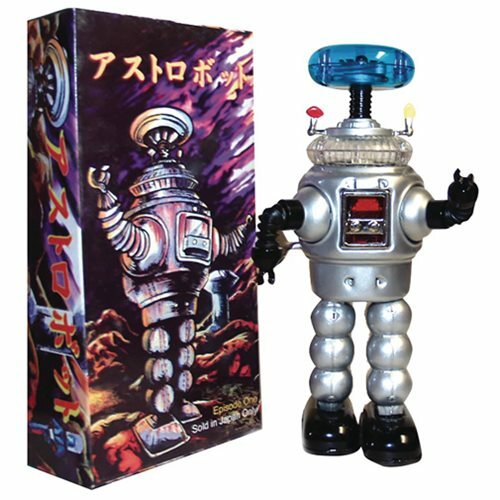 The Lost in Space Robot Silver Tin Wind-Up Toy features a strong walking mechanism with sparking feature in the chest and lower dome. Robot stands 9-inches tall and features metal antennas and translucent blue top dome. Excellent craftsmanship and detailing in all aspects of this robot, including tin radar dish inside his dome, plus his arms are expandable and bendable and give this robot great character and expression! Wonderful classic artwork of robot walking through galactic space storm on his planet created by Justin Volpe.